In honor of an exhibition of Chinese art (or in memory of late North Korean dictator and movie fanatic (a bad combination, we can all agree (oh, look at me, being all topical just because I downloaded a basic newsreader ap on my cheap Android tablet PC and now act like I know everything (probably just overcompensating that I got laid off from my hanging-by-my-fingernails newspaper gig this year and never will live to be paid to work at a newsdesk (and a happy 2011 to you all too, dammit)))) Kim Jong Il II, the Cleveland Museum of Art is showing a series of recent cinema from China, with admission free to the public. Either that or the Chinese called in a loan and now own the place, an equally likely scenario. And if you thought that preceding paragraph was difficult to read, get a load of SUZHOU RIVER, a stylish thriller from 2000 that was technically a Chinese-German co-production. While many films from the emerging free-market Peoples' Republic were rather staid and cautious in their mise-en-scene, not wiling to abandon socialist realism altogether, this one is a complicated fever-dream suspense drama more akin to the exotic-cosmopolitan tastes of Cantonese film industry of Hong Kong. Setting is modern Shanghai. Mardar is a motorbike deliveryman, often carrying contraband packages for local crime lords. One of his shady- businessman clients hatches an illegal scheme implicating Mardar's innocent teenage girlfriend Moudon as an unwitting accomplice. 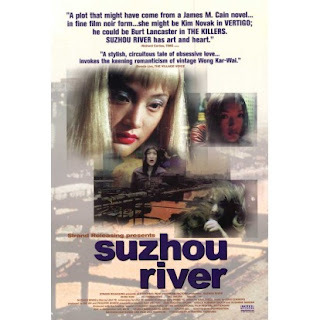 Something goes wrong, and Moudon vanishes, becoming over time a latter-day urban legend, a "mermaid" glimpsed from time to time along the banks of the city's Suzhou River. The gimmick is that the unseen, unreliable narrator of the tale is a freelance videographer (no, this is not a mockumentary, despite some lens POV-stuff), who may know more than he's telling, especially the possible connection between Moudon and the cameraman's own, enigmatic on-again-off-again lover, Meimei - a seductive, houseboat-dwelling nightclub performer with a mermaid act, played by the same actress who portrayed Moudon.